Prior to flight, it is important to familiarize yourself with the unique characteristics of the aircraft. Whether you are an aircraft owner, new student pilot, a rusty pilot, or borrowing an unfamiliar plane, it can be helpful to have a quick reference guide about the aircraft to leaf through prior to flight. The pilots at Aviation Insurance Resources (AIR) have created just the resource, available for free, called “Know Your Aircraft”. Know Your Aircraft is a useful eight-page booklet perfect to store inside your aircraft. 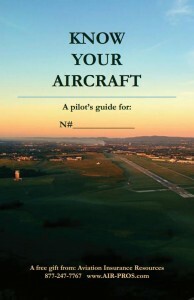 Page one covers the basic aircraft and pilot information, followed by important self-maintenance items such as tire pressure and oil weight and capacity. Further in the book are areas to complete emergency procedures and V-speeds specific to the aircraft. A full colored spread is also included to quiz the owner on taxi and runway markings as well as tower light signals. Other topics covered are aviation weather, take-off and landing distances, and weight and balance. Safe flying leads to aviation insurance discounts and safety was exactly what the pilots and agents at AIR had in mind when creating this booklet. To receive your FREE Know Your Aircraft booklet visit AIR at EAA AirVenture in Oshkosh, WI or click here to download it online today!